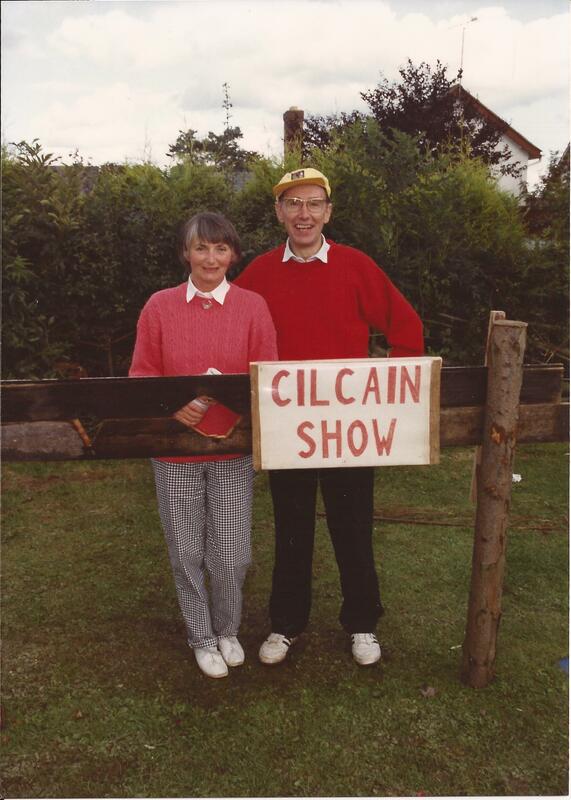 The Annual Show in Cilcain is held on August Bank Holiday Monday. 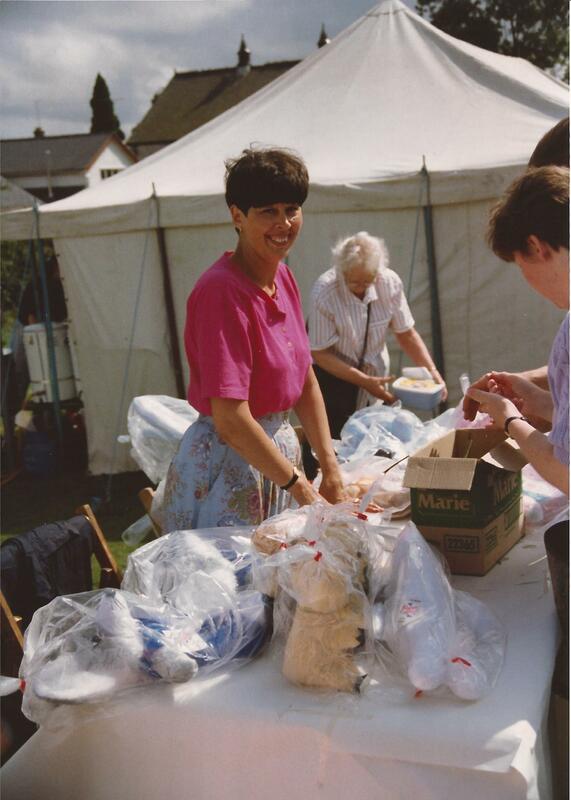 In 1999 about 4,000 visitors were attracted to this traditional village show and some 200 people in the community were involved in the voluntary organisation. Central to the Show is an exhibition of home and garden skills, craftsmanship and people having fun together at simple games, music and dancing. It is held on the Waen behind the Village Hall, which used to be the playing field behind the old Church School. Large marquees are now used to house the displays and the refreshments, while art and photography competitions are mounted in the Village Hall. A local voluntary silver band plays outdoors and lengths of bunting in green and red colours extend out into the village. Something for most tastes is provided by many stalls, ice cream outlets and delicious foodstuffs. The Dog Show attracts several hundred entries and the Mountain Race expects upwards of 150 runners. The local press like photographs of the home baking or flower exhibits, children with their pets and the massed start of the Mountain Race at 1 pm. 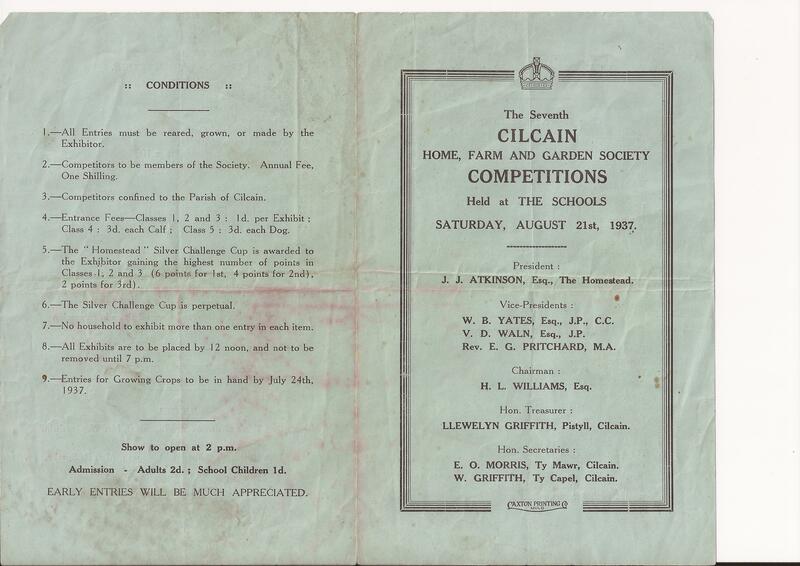 The Cilcain Show may have origins as early as 1923 in the Cilcain Home, Farm and Garden Society. 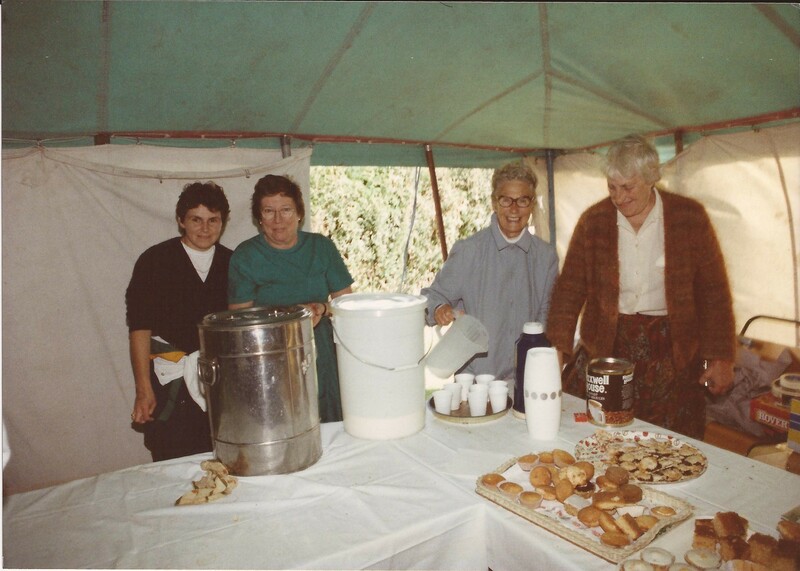 This Society held regular meetings in houses and farms to learn from neighbours and visiting speakers. In 1929 a meeting of “farmers and interested people” was held at Cilan Lodge when it was decided to run a Show each year. 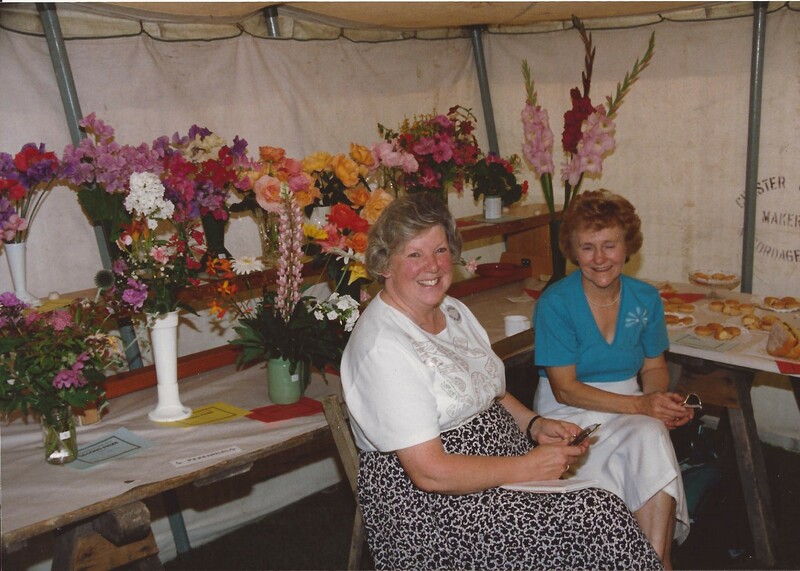 So began an annual show which comprised competitions between a very wide spread of talents, many of which were exhibited at a garden fete and others that were judged on site during the previous week such as livestock and field crops. The oldest trophy now in use was presented by Mr H L Williams, Cilan Lodge, in 1930. This was won 3 years in succession by Mr T Rushforth, Plas Newydd, who then retained it for his lifetime. 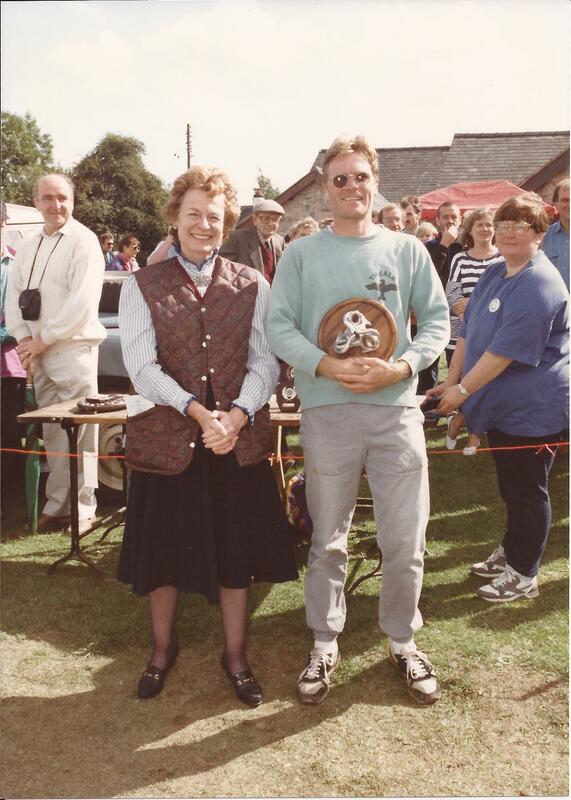 The H L Williams Challenge Cup was returned to Cilcain Show by his daughter Mrs A Kinsey-Miles in 1996 to resume in perpetuity the annual competition for most points won by members of one household. The Show first became commercial in the wartime when exhibits were given and auctioned for Red Cross funds. During the 1940s the Show appears to have suffered some changes in identity and the first Horse Show occurred in aid of Salute the Soldiers Campaign. In 1954, when heavy debts were being incurred by St Mary’s Church for roof repairs, Rev. Henry Rees resurrected the Show as a Home, Farm and Garden Show at the V P School and Village Field. This was in aid of the Church Restoration Fund. Admission was 6d (2.5p) and children 3d. The Show was formally opened at 2 pm by Miss V D Buddicom, Penbedw Hall, on August Bank Holiday Monday – the first Monday in August. The Home and Garden exhibition was mounted in the Schoolroom (now Village Hall). Farm entries previously judged on site included cattle, sheep and pigs and field crops. The first Dog Show was held on the centre of the field (the Waen). 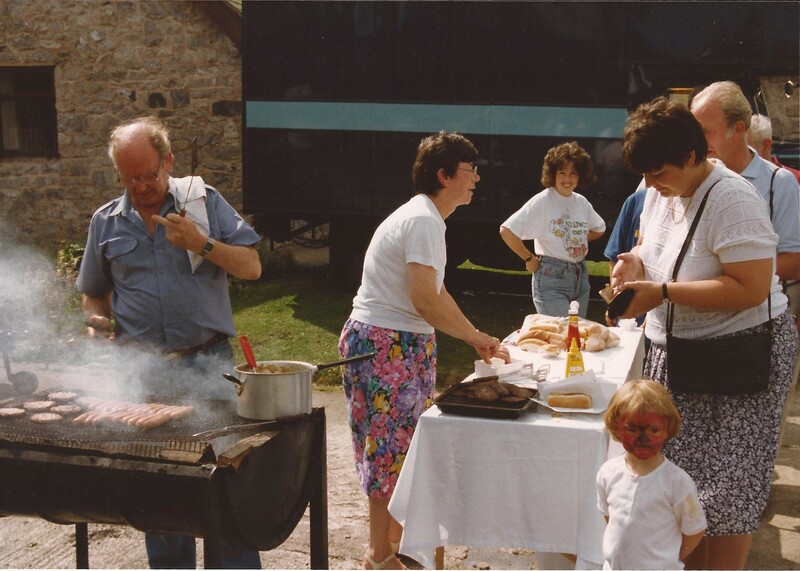 “Amusements” included a Puppet Show by the Simey family, locally made ice cream and refreshments. The children’s Fancy Dress parade was introduced and ran consistently until 1995, then resurrected in 2005. Cilcain Home, Farm and Garden Show was fully reported in those days by the Leader newspaper. The title was gradually reduced to Cilcain Show. The field crops judged in 1956 were mangolds and kale, oats, barley and wheat. The Home competitions included a dressed chicken, home-made butter and eggs. There was also a Pigeon Section. The incumbent vicar chaired the organising committee of the Show and Miss Yates, Cilcain Hall, was president for the first 5 years. She was succeeded in 1959 by Miss Lockhart. Various notables were invited as Guest of Honour to open the Show. Following Miss Buddicom, Penbedw Hall, in 1954, came Rt. Hon. Nigel Birch MP in 1955. The local MP was Economic Secretary to the Treasury and he complimented Cilcain Show on “going from strength to strength”. He added that the Church in Wales had great responsibilities and wonderful buildings to safeguard. There was a responsibility to see that the Church was cared for as it should be. In 1957 a display was given by 30 Yugoslav dancers staying at Colomendy Camp after performing at the International Eisteddfod in Llangollen. 1958 saw the first sponsorship when cake baking competition prizes were given by Weetabix. Trophies included the Rushforth Cup for most points in the Home Section. That year saw the Home and Garden exhibition held in a marquee for the first time. The first list of commercial sponsors also included Synthite and Jones Bailers, Mold, and Sir John Brocklebank. The day was rounded off with a Village Dance in the evening. Miss D M Thomas, former head teacher of Cilcain VP School for 26 years, opened the 1959 Show. A new competition was for Children’s Handwriting. In 1960 Mr George Le Roy-Acton arranged the first Moel Famau Mountain Race. Rev Henry Rees was the Summit Umpire with a “secret stamp” to mark the runners’ cards. The outright winner was George Young (45) of Chorley, second Harry Williams (20), the Crown, third John Beach (21) the Homestead (now Ty Coch) and First Lady was Susan Beach (14). There were 19 runners and the winner’s time was 37 minutes. 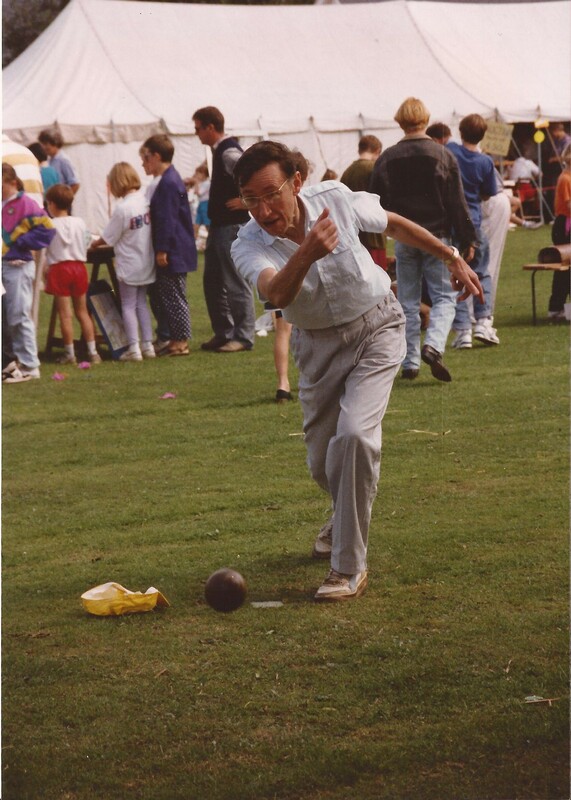 This first race was held on a Saturday in July, but later it was held on August Bank Holiday attracting more visitors and adding interest to the Show. The 1960 Show was opened by Commodore of the Cunard Fleet G H G Morris, Bod Erw. Sideshows were in the charge of the sidesmen of the Church. There was still an outstanding debt of £1750 to service. Under the new president, Professor T S Simey, in 1961 the first Pony Gymkhana was organised by R J Hughes. The Dog Show was judged by Mrs Phillips, Celyn. Annual profits in 1961 and 1962 were both about £200. Presidents in 1963 and 1964 were Captain N M Archdale, Penbedw, and Mr Brad Plimmer, Mold Auctioneer. A “small army of workers” assisted on the day. The Sunday School boys put up stands and trestles. Admission charges had increased to 2 shillings (10p), children 6d (2.5p). In the Garden Section Mr Rushforth, Plas Newydd (54 acres) won 13 out of 25 classes, while Mr Julian Hughes won 7 first prizes, 1 second and 3 thirds. It was in 1965 that Harold Wilson’s government moved the August Bank Holiday to the last Monday in the month. 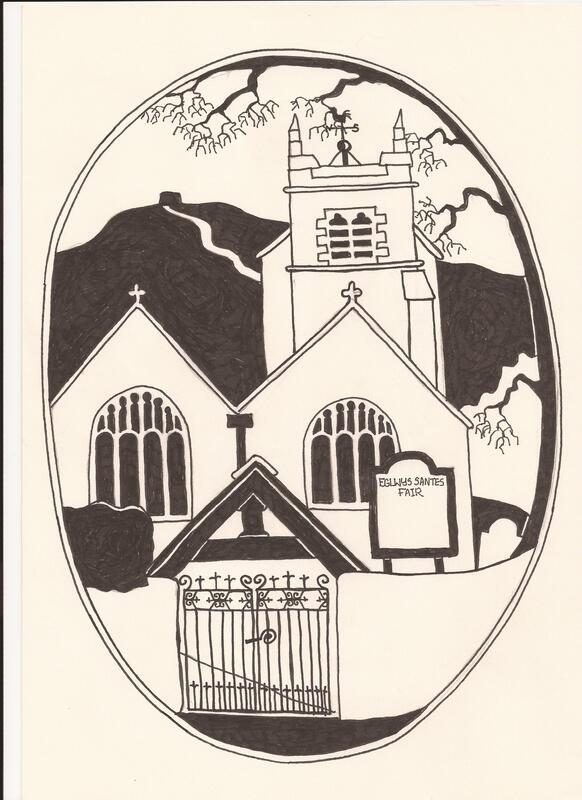 The Cilcain Show, chaired by Rev Dibden Williams, shifted its date to conform. There were 250 entries in the Home and Garden marquee despite this coming one month later in the growing season. In 1966 a larger marquee of dimensions 45 ft by 30 ft was hired from Nannerch Mill. The Show was opened by a previous vicar, Rev R E Hughes and Miss Yates, Cilcain Hall, was again the President. The name Cilcain Home and Garden Show was changed in 1968 to “Cilcain Home, Garden and Pony Show”. It was opened by Lord and Lady Mostyn. A First Aid Post was mounted by St John Ambulance for the first time. Next year both St John and Red Cross attended the Show. A net profit of £230 was made. The committee sought younger members and Mr Owen Thomas and Mr Robin Wolley joined. A marquee 65 ft by 30 ft was hired from Williams Bros. Wrexham for £25. Cacti and succulents were discontinued. Mr Latham Parry, Plas Yn Llan, provided his field next to the Waen for car parking from 1969 until withdrawing it in 1993. In 1970 the admission charge was raised to 3 shillings (15p). Miss Mary Macdonald and Mrs Boatswain manned the gate. Mr J Barry Duff became Treasurer in 1972 and recorded a net profit of £340. Atrocious weather struck the Show but 11 tents had been set up for stalls and games. 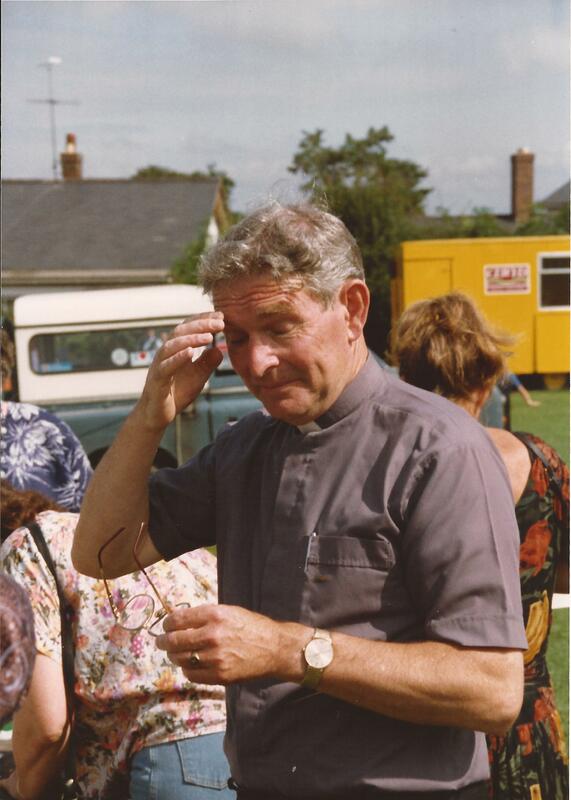 Rev Henry Rees returned after many years to open the 1973 Show, and the Mountain Race was revived. The Piano Smashing Competition was won by Cilcain for the third successive year. Monday 25th August 1975 was the first fine day the Show had experienced for over a decade, a significant effect perhaps of shifting the Bank Holiday to the end of the month. There were 70 dogs entered, Rhydymwyn won the Tug-o-War, 20 runners competed in the Mountain Race. The total crowd was about 1,000. A Piano Pushing Contest was won by Rhydymwyn. The Ground Marshal was Mr Neville Williams who observed that “the Waen is just right for a village show”. The net profit was £533. After the following year’s show both Secretary Mr Peter Swensson and Treasurer Mr J Barry Duff stood down, and Mr Brian Pringle, 2 Lon Cilan, became Show Secretary for 2 years. 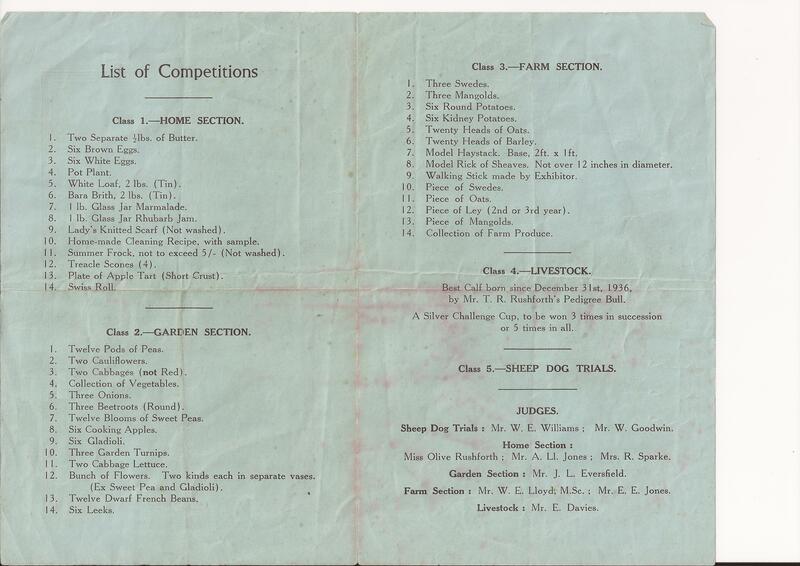 Mr Keith Bennett of Bronwylfa arranged a Gymkhana on Bod Erw field for several years. 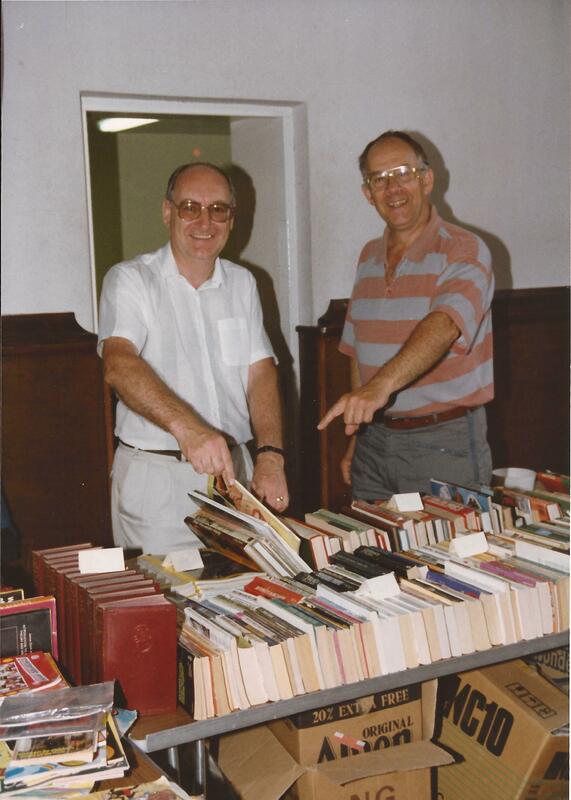 Mr Roy Fisher took over as Secretary in 1980, with Dr Ron Simpson as Treasurer. Miss Florence Williams presented the trophies. The new car park and bowling green were built in 1981. Disruption to the Show alongside was overcome and the net profit surged to £1,359. In 1982 the Show contracted the services of the Royal Buckley Town Band for £50 plus refreshments. However the day was relentlessly wet! Following this Roy Fisher handed over the Secretary job to Mr David Hall and Miss Mary Macdonald on becoming PCC Treasurer for the next 12 years. Village Hall Extension The new Joint Secretaries found more tables for refreshments in a tea tent and more chairs everywhere. Mr Doug Gregg took over the Mountain Race from Mr Robin Wolley. 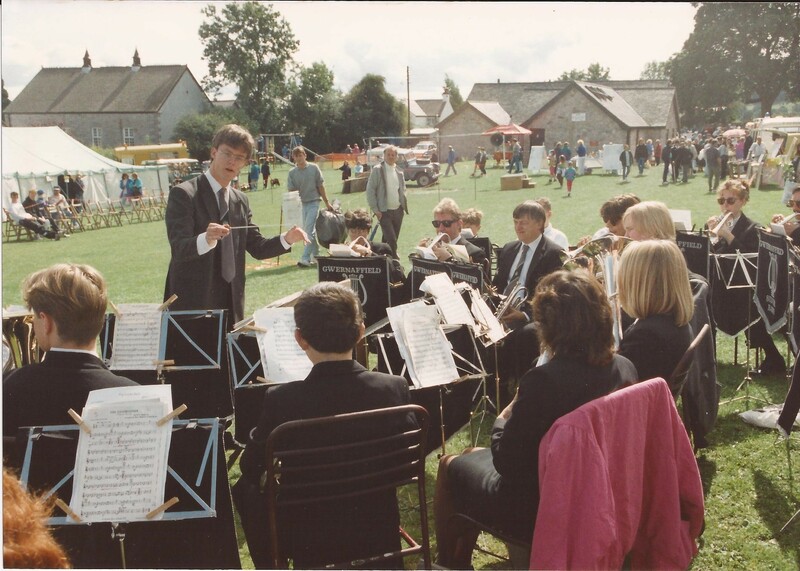 Considerable reorganisation of the Show was required at this time because the Village Hall was not available in 1983 or 1984 due to refurbishment and extension. Some Home and Garden displays were arranged in the Church but misgivings were expressed by parishioners for a number of years. During this time the Gymkhana/Horse Show ended its short and somewhat divisive history. Admission charges were raised in 1984 to 40p for adults, 10p for children. Mr Norman Tate made a grandmother type clock and presented it to the Show for raffling, a generous gift which he continued for several years. George Barlow’s marquee (45 ft by 30 ft) was hired for £60 plus insurance – it had to be collected from Caerwys, erected and returned by volunteers under the guidance of the Show Secretary. Mr David Hall resigned as a Joint Secretary in 1988 and handed over to Mr Robin Williams. Shortly afterwards Miss Mary Macdonald also stepped down and handed over to Mrs Lesley Williams. 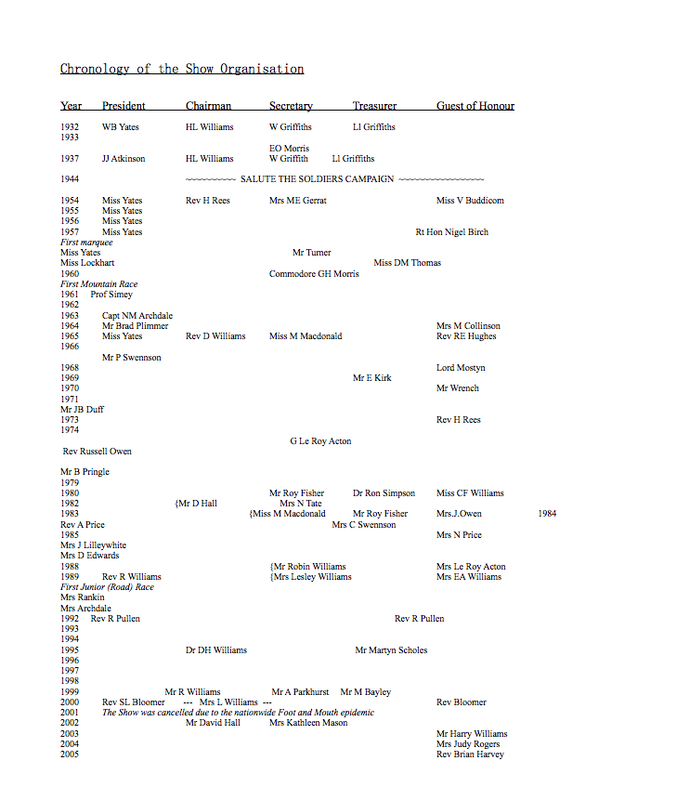 The Williams family developed the Show for many years with four incumbent vicars and three interregnums. They invested in a spread of marquees from Peter Stubbock of Chester, with which to manage inclement weather. They introduced measures to meet overhead expenses ahead of the Show, having found insurance against weather cancellation not viable. A Grand Draw began selling in May, starting with £100 first prize, which financed the marquees. Advertising in the schedule was paid up in time to meet printing costs. Stall holders were vetted for quality, booked and paid for on a sole concession basis. Wendi Williams designed new publicity and later James Eccleston redesigned the Schedule and posters. Messrs Clement Jones provided professional road signs and Race Banner. Delyn Borough Council withdrew their Bouncy Castle but provided much new bunting for the Village and decorative rope for the car park. 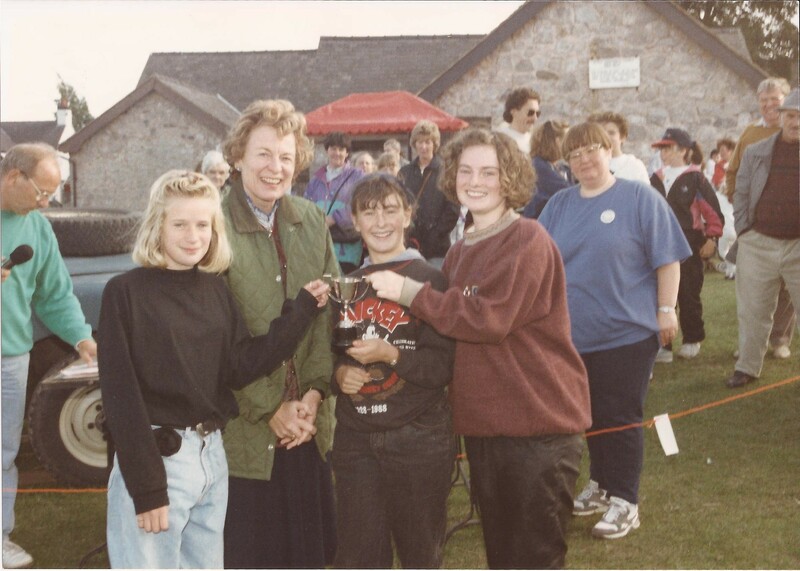 The Junior (Road) Race was devised in 1990 to meet the growing interest of under-16 sons and daughters of regular runners, beginning with 25 runners and 2 trophies. NEWSAR (North East Wales Search and Rescue) was invited to mount a safety plan for the Mountain Race. Displays and performers were presented in a central arena and plenty of room maintained for the growing crowds to move around or sit and socialise. The Home and Garden, Art and Handicraft competition displays were still given pride of place and stewarded accordingly. Gardeners, handicrafts, artists and photographers consistently presented exhibits of a high standard. With attendances of between 3,000 and 5,000 car parking was a growing problem and the Air Training Corps, Mold Squadron, were invited to assist in the organisation of parking. 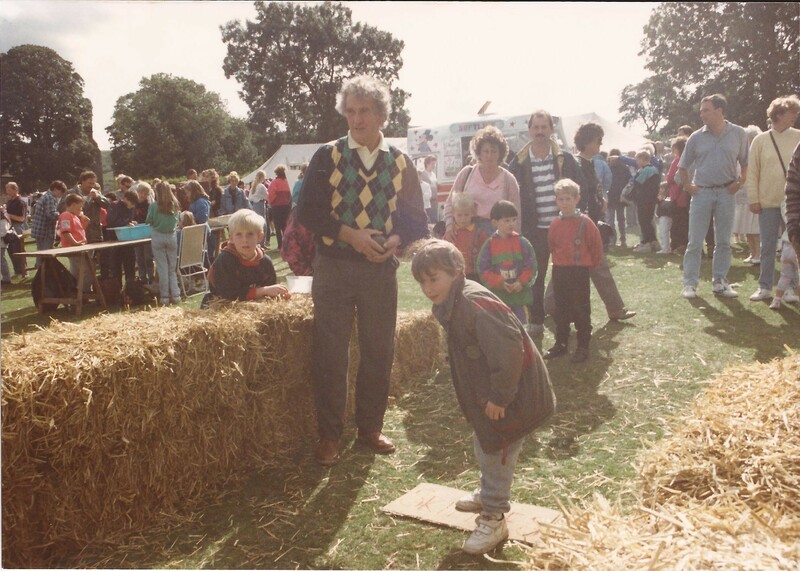 To provide more space the car parks moved further from the Village; Mr Owen Thomas ran a “hay wain” towed by his Ferguson tractor to carry families between car park and Show when the car park was first moved out of the Village. A display of many types of Austin 7 vehicles arranged in the village car park by Mr Phillip Parsons for several years was followed by classic cars and sometimes the Mold Fire Engine. The admission charge remained low (£1 and 50p concessions), car parking was free and there was no obvious commercialisation at the Show, but its financial success spiralled to soon making between £3,000 and £5,000 profit depending upon the weather. This was determined in the ‘90s to be for St Mary’s Church Building Fund while there was a growing determination to improve the lighting, heating and North Aisle.